This blog originally appeared at ODI Development Progress under the title “Private development assistance: a glimpse of the landscape”. Such assertions have become something of a mantra in today’s development sector. But are they supported by any hard evidence? This was the starting point for our research into private development assistance (PDA): to analyse how much PDA there is, who is giving it, and where it is going. We analysed data for PDA flows in chapter 7 of our Investments to End Poverty report (September 2013) Our in-depth analysis of PDA, looking at issues, trends and outlining our methodology, will be published in the coming months. Growth trends for PDA are estimated on the basis of recorded growth across a sample of NGOs, foundations and corporations that represent (respectively) $10 billion, $6.4 billion and $2.8 billion in PDA annually. An analysis of 23 countries (OECD DAC countries) shows that they provided $45.3 billion of PDA in 2011 (or the latest year for which data are available). The top countries were the US, the UK, Germany, Canada and Australia. Figures in $US billions, 2011 data (or latest available). Source: DI forthcoming report. Where disaggregation of PDA into NGO, foundation or corporate giving was not possible, the category ‘PDA unspecified’ is used, comprised of different types of PDA. 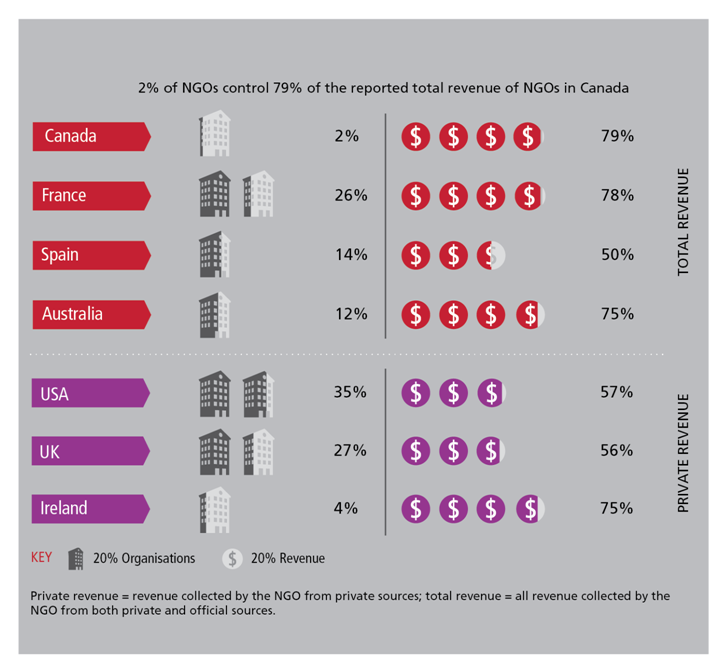 In countries where the information was available, we found evidence that PDA funding is highly concentrated among a few large non-governmental organisations (NGO)s and foundations. The remaining funds tend to be fragmented across many thousands of small actors; small NGOs and civil society organisations (CSOs). How much PDA reaches developing countries? Like official development assistance (ODA), PDA involves a mixed bag of actors, channels and channels. The ‘bundle’ of PDA flows is different in different countries, although the main channel of delivery of PDA from DAC countries is NGOs. DI’s approach to PDA, as with ODA, is to disaggregate data on resources, to find out how much actually reaches developing countries. A key source of PDA data is the Center for Global Philanthropy’s (CGP) yearly Index of Global Philanthropy and Remittances. The Index provides wide-ranging and useful data on trends in philanthropy towards ‘development’ from the donor perspective. Again, as with ODA, the top-line figures from the Index include funds not transferred to a developing country. For example, grants to foreign students studying in the donor country or taxes paid in the US for export of corporate gifts. The total figure CGP gives for the US’s philanthropic ‘engagement with developing countries’ in 2010 was $39 billion. Of this, we find at least $5.1 billion (13%) was not transferred, but spent in the US. An additional $8.6 billion (22%) was made up of ‘in-kind’ assistance (gifts in kind). 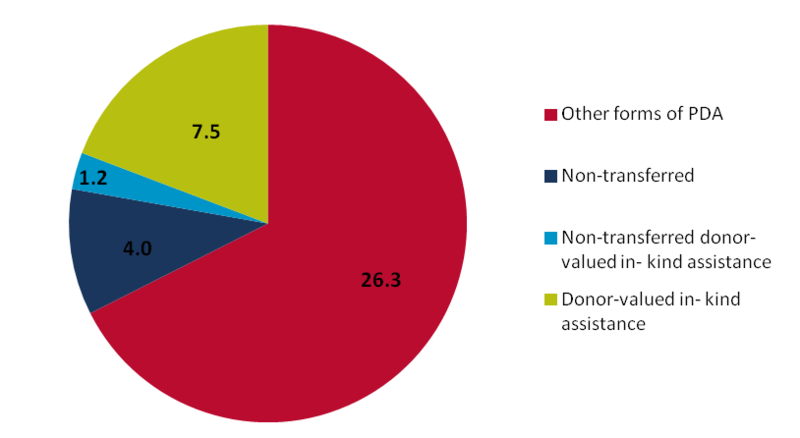 Of this, at least $3.7 billion was donor-valued volunteer time (the dollar value of aid-in-kind is estimated by the donor and includes the value placed on volunteering – often valued at over $20 per hour by USAID). Total US PDA (in $), 2011, for ‘engagement with developing countries’: CGP data and DI calculations. Achieving the post-2015 global goals will require all potential resources to be harnessed – domestic revenues, commercial investments, official finance and contributions from NGOs, foundations and private individuals. Two pre-conditions – comparability and transparency – must work in combination to harness resources to achieve these goals. 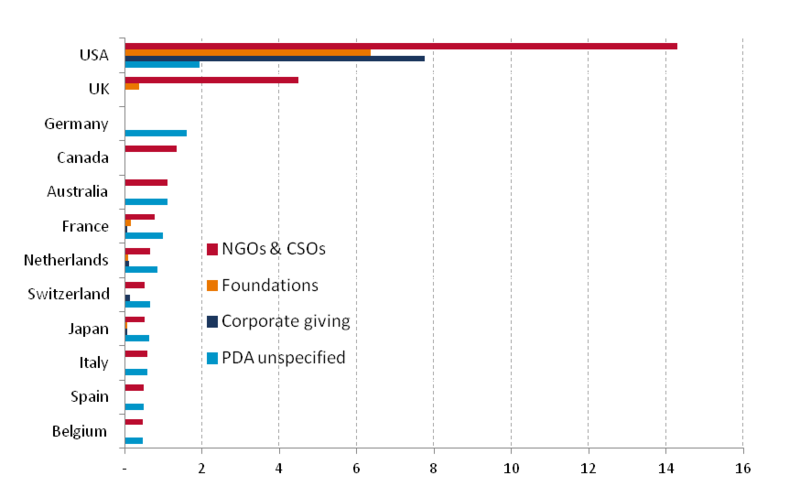 Although there is progress on PDA actors’ participation in and alignment with the mainstream development dialogue (for example, the OECD netFWD) and existing data on PDA are being complemented by data reported to the International Aid Transparency Initiative (IATI), PDA flows remain opaque and patchy in terms of global coverage. PDA is usually visible only at the top level of giving, so its traceability to sub-national levels is not possible for the time being. Better data are starting to come on-stream in comparable formats. As more NGOs and foundations publish their information via IATI, a critical mass may be reached in 2014 or 2015, allowing us to use IATI as a key dataset. However, there are major challenges with PDA data collection in many emerging and developing countries, where basic reporting infrastructure and policies for non-profit management and registration are still lacking. What’s more, restrictions on philanthropic freedoms and the tight state regulation of nonprofits’ activities in some countries may threaten the potential of PDA and local philanthropy to catalyse and support development. In the context of harnessing all resources for poverty eradication and other global goals, PDA needs to be better understood and leveraged. For that to happen it has to be made visible and comparable. Transparency is also essential for accountability – unless we can trace finance through the places and people where is it designed to have impact, those people will not be able to provide feedback on its effectiveness. Better data can help us to understand the comparative advantages of private development assistance, enabling faster progress on ending global poverty.